The twenty-first century is off to such a rocky start; dangerous games of tug of war between opposing ideologies. Inevitably a historian will tell the future world that we were all frantically seeking balance; exclude or welcome, right or left, stay or exit. Here is a diptych; an item of art created in two separate parts, from the Greek δίπτυχον, di “two” and ptychē “fold”. We think of an ancient altarpiece, icons painted on hinged wooden panels, perfectly balanced. When I saw this diptych my mind went to Woolf’s Orlando asleep under the oak tree, I thought about a dreamy polaroid of someone I once loved, I remembered waking my sleeping child, long ago, in a seaside house. 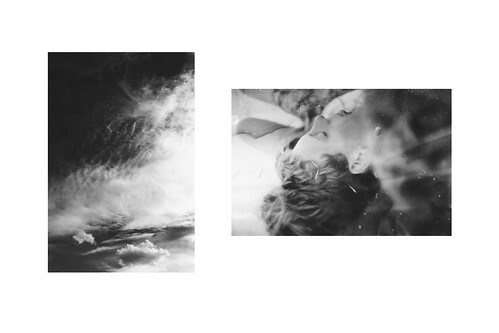 When Mathilda, the photographer, made this diptych she thought about dream a little dream. The soaring clouds and the sleeping face really do sing that tune. In this case there is an easy balance between the artist and and the viewer. Orlando would have danced to The Mamas and the Papas, and so would the lost love, my child grew up to play Dream a Little Dream on her dad’s guitar. Dream dreams, celebrate beauty, find balance.